Answer: Many people try to ignore their debt problems until they “figure it out.” Unfortunately, once you receive a court summons, you must take action immediately. First, make sure the debt is valid. Occasionally, receiving a summons suddenly (sometimes without prior warning) can mean your identity has been stolen and/or that the debt is erroneous. However, if the debt is valid, you need to seek help and it’s advisable to hire an attorney. Ignoring a summons or refusing to accept a summons will not make the problem go away. In fact, it can make it worse. Court summonses are legally binding documents that are filed through the county. If you don’t respond or appear in court on the designated day, it’s likely a default judgment will be entered against you. Worse still, judgments often are harsher when you fail to respond, and the judge may add attorney fees, court costs and interest to the total judgment. Many people assume that if they cannot pay their debt, there’s no point in responding to the summons because a judgment would be granted in the creditor’s favor regardless. But even a minimal or brief response is better than none at all. Court judgments can grant creditors a few options to forcefully recover debt, including the ability to garnish your wages and place liens against your property. The creditor may even be able to file a secondary motion to freeze your assets or seize your bank account. Start by contacting a debt-relief attorney to discuss your options. While you can respond to the summons on your own and without legal counsel, doing so is not recommended. Your creditor likely has a team of attorneys on its side, so it’s best if you’re represented. It’s important to get an attorney involved quickly after receiving the summons because there is a brief window of time, before the court date, that you may still be able to negotiate a settlement with the creditor. Settling out of court is almost always preferable to having a judgment against you, and once a judgment is entered, it can be very difficult to overturn. Note: In some cases, you may legally receive a court summons without ever being physically served one. 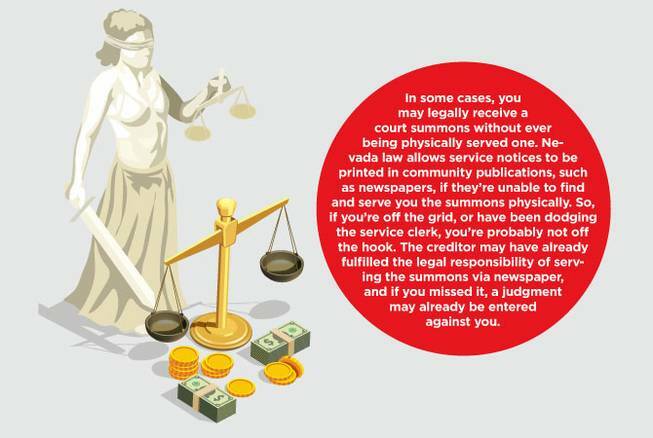 Nevada law allows service notices to be printed in community publications, such as newspapers, if they’re unable to find and serve you the summons physically. So, if you’re off the grid, or have been dodging the service clerk, you’re probably not off the hook. The creditor may have already fulfilled the legal responsibility of serving the summons via newspaper, and if you missed it, a judgment may already be entered against you. When you have debt collectors after you, don’t wait to receive a summons before acting. If you have a lot of debt that you cannot pay, it’s likely time to consider filing for bankruptcy or negotiating a settlement. Some people may be hesitant to file bankruptcy because they’re concerned about the consequences to their credit, but having a judgment against you is much more damaging on a credit report. And in Nevada, judgments stay on your credit report longer than a bankruptcy. Further, when faced with a bankruptcy versus a judgment, bankruptcy is a better option because it absolves many of your debts. Once a judgment is filed, you have no control over what the creditor can access and take when recovering the debt, but with bankruptcy, you’re in control and able to protect many of your assets.